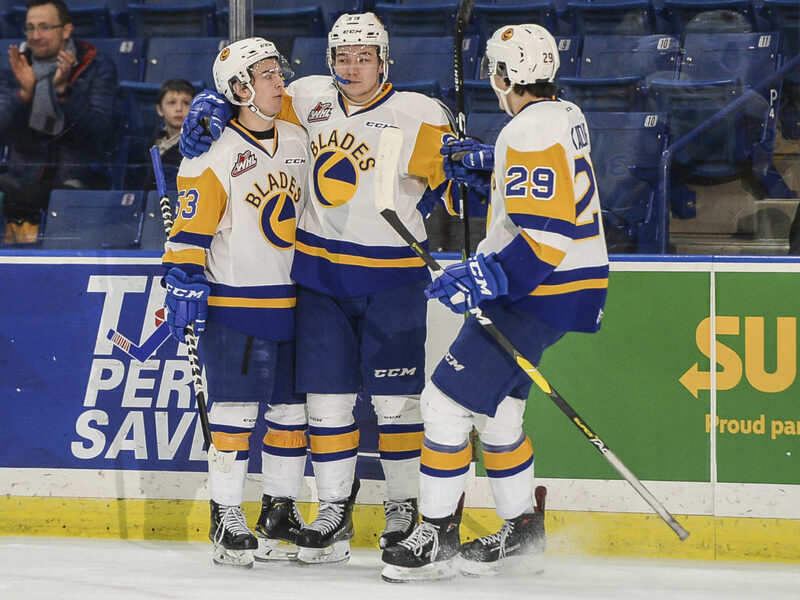 The Saskatoon Blades won their fourth consecutive game and hit double digits on their point streak (8-0-2-0) with a 6-3 victory Sunday afternoon at SaskTel Centre in front of 4,815 fans. Saskatoon improves to 34-13-8-0 on the season and holds an eight point lead over the Moose Jaw Warriors in the East Division. The Blades got out to a hot start with some quality chances on the first shift of the game. Wheat Kings netminder and Vegas Golden Knights prospect Jiri Patera was up to the challenge until Riley McKay opened the scoring 9:23 into the frame. Dawson Davidson found McKay all alone at the Brandon blue line with a stretch pass, McKay then went in and made a smooth move to open up Patera and slide the puck five-hole for his 10th of the season. That came shortly after McKay exited the penalty box after a spirited tilt at centre ice with Wheat Kings 6’7″ defender Braydyn Chizen. Davidson’s assist on the play extended his personal point streak to 13 games while Tristen Robins chipped in with the second helper. Then Kyle Crnkovic (7), who was celebrating his 17th birthday, made it 2-0 with a power play marker; Max Gerlach and Tristen Robins assisted the goal. Less than a minute later, captain Chase Wouters ripped a wrist shot from off the rush from the right wing and beat Patera cleanly to make it a 3-0 lead for the home team. The Blades also lead 12-9 on the shot clock at the first intermission. The second period began with a 4-minute power play opportunity for Saskatoon, but it would be the Wheat Kings’ Linden McCorrister (12) taking advantage of a lucky bounce to get on the board. The captains then exchanged goals as Stelio Mattheos (33) got one through on a power play, then Chase Wouters (12) buried his 2nd of the night less than a minute later. Rookie Ridley Greig (11) got the visitors in black & gold back within one before the 2nd intermission; another power play tally for Brandon. In the final period, Dawson Davidson (11) ripped a wrist shot through traffic on the power play to give the Blades some insurance. Then Riley McKay (11) beat out an icing after an empty net attempt from Nolan Kneen to seal the victory with his 2nd goal of the night. Nolan Maier chalked up his 28th win of the season with a 25-save effort while Jiri Patera went 31/36 at the other end for Brandon. Each side went 2/7 on the man advantage. Dawson Davidson ran his point streak (3G-18A) to 13 games with 1G-1A. Max Gerlach had 3 assists to bring his point streak to 11 games (9G-10A). Kyle Crnkovic scored his 7th goal of the season on what was his 17th birthday. Tristen Robins had 2 assists in the win and was over 50% in the face-off circle. The Blades hit the road for their final big trip of the season. They’ll play three games in the Central Division beginning on Wednesday in Medicine Hat, Friday in Cranbrook for the final time in history, and then wrap things up on Saturday in Lethbridge against the Hurricanes.